They know some gamers will groan. But they're confident: you just need to try it. "It" is not Guitar Hero 5 DS, which you might have expected this fall. There's no such thing. Enter Band Hero DS. This November, Activision's Vicarious Visions studio will release its fourth music game for the Nintendo DS. Band Hero DS follows a trio of shrunken Guitar Hero games that were playable on Nintendo's handheld with a bundled guitar grip that plugged into the Nintendo DS' Game Boy Advance slot. The add-on simulated the feel of a guitar fret. The portable Guitar Heroes were hits with kids but have suffered mockery by many reader of sites like this one, who have surmised that the games on the DS are only good for hand cramps and embarrassment. "No matter what your game is, you're always going to have a subset of people who won't want to play it for philosophical reasons," David Nathanielsz, the game's executive producer at Vicarious Visions told Kotaku in a phone interview earlier this week. "That's unfortunate for us because there is a large group of people who see pictures of Guitar Hero DS or Band Hero DS and say, 'That looks dumb' or whatever. 'I never want to play it.'" But play it and you just might be converted "I don't think we'll get everyone," he said. "But if we can get the message out there for people to try it…"
What if people could get over their apprehensions? What would they find? Vicarious Visions' new game, Band Hero DS lets four people use their systems to play in a virtual band together. Its drum and guitar peripherals work only with the middle version of the DS, the DS Lite. Players can attach the guitar grip to play lead guitar or bass, wrap a sleeve of rubberized silicone around the system — the "drum grip" — and tap on mini drum pads to play drums or sing into the DS mic for vocals. And gamers can configure their band with any combination of those instruments, allowing for an all-vocals band or one with two drummers. Imagine a quartet of players jamming together. The DS of each of the four gamers, linked over local wireless, emits the music of the game's more than 30 master tracks. Unlike Daigasso Band Brothers, the Nintendo-published multiplayer music game released in Japan in 2004, each system won't just play the sounds of the instrument its gameplay is tied to. Each one plays all of the music. Being on a fourth iteration of a design helps. The developers of the portable Heroes repeatedly tweak their systems for detecting the strumming — and now also the drumming — efforts of their players. Some players, Nathanielsz said, lift their stylus after each strum. Some never lose contact with the screen. The game has to recognize that variety. Vicarious Visions has cleared elements from the touch screen and tweaked the programming again to improve strumming responsiveness. For drumming, the game will recognize taps on its drum pads, not, as some may have anticipated, on the DS touch screen. A touch screen interface was considered, Nathanielsz said, but the DS' inability to recognize more than one tap on its touch screen at a time introduced the risk of the system failing to recognize two rapidly successive taps, particularly if the player was inputting them with two styli or fingers on the left and right sides of the screen. Going with something more button-based literally felt better for Vicarious Visions. "When we sat down and started prototyping drum play we wanted to replicate the rhythmic, kinesthetic experience of drumming," Nathanielsz said. "What we quickly realized is the movement of your thumbs in a horizontal and vertical direction was really compelling and fun." The gameplay that way should have the quickness and a bit of the physicality of drumming in real life. The new game also includes WarioWare-sized, music-themed mini-game challenges that can be thrown at players in a competitive mode to throw them off or can be given to a struggling player in co-op mode to earn a boost. All songs are unlocked at the beginning of the game, but an expanded single player batch of 200 Achievements-style "Awards" spread across four instrument-based progressions has been included to help add longevity. The game does not support the DS' Wi-Fi functionality and Nathanielsz said there are no plans to support downloadable content (as expected given the DS Lite's lack of storage capacity). Why isn't this game called Guitar Hero 5 DS? Activision is splitting its rock-based Hero games this fall with both a Guitar Hero sequel and the new Band Hero console and portable game. The latter has a broader and more pop-inclusive soundtrack. Tracks include artists ranging from Queen to Pink to No Doubt. To the skeptics, note Vicarious Visions' philosophy with these games. 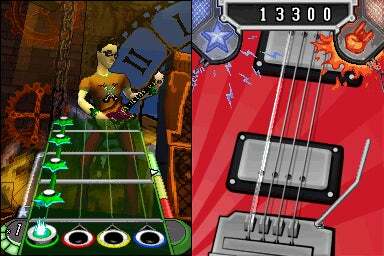 "We're not trying to replicate 100% the experience of Guitar Hero on the DS," Nathanielsz said. "The console games might be trying to make you feel like a guitarist... we're trying to abstract that one step. How can we make a great music game based on playing in a band?"